22 posts categorized "Author Visits"
Doreen Cronin (ill. Harry Bliss): Diary of a Worm. HarperCollins. Completed January 2, 2010. Julianna Baggott: The Prince of Fenway Park. HarperCollins. Completed January 8, 2010. Neil Gaiman (ill. Brett Helquist): Odd and the Frost Giants. HarperCollins. Completed January 9, 2010. Wendy Mass: 11 Birthdays. Scholastic. Completed January 9, 2010. Grace Lin: When the Mountain Meets the Moon. Little, Brown Books for Young Readers. Completed January 11, 2010. Joni Sensel: The Farwalker's Quest. Bloomsbury USA Children's Books. Completed January 17, 2010. Jarrett J. Krosoczka: Lunch Lady and the Author Visit Vendetta. Knopf. Completed January 17, 2009. My review. Joan Aiken (ill. Andi Watson): The Serial Garden: The Complete Armitage Family Stories. Big Mouth House. Completed January 21, 2010. Madeleine L'Engle: A Wrinkle in Time. Square Fish. Completed January 23, 2010. Madeleine L'Engle: A Wind in the Door. Square Fish. Completed January 26, 2010. Rebecca Stead: When You Reach Me. Wendy Lamb Books. Completed January 28, 2010. My review. Rachel Ward: Numbers. The Chicken House. Completed January 1, 2010. My review. Caroline B. Cooney: They Never Came Back. Delacorte Books for Young Readers. Completed January 12, 2010. My review. Dom Testa: The Comet's Curse: A Galahad Book. Tor Teen. Completed January 18, 2010. My review. Harlan Coben: Long Lost. Dutton. The 9th Myron Bolitar mystery. Completed January 9, 2010. Charlaine Harris: All Together Dead (Sookie Stackhouse #7). Ace paperback. Completed January 29, 2010. © 2010 by Jennifer Robinson of Jen Robinson's Book Page. All rights reserved. I have a new post up this morning at Booklights in which I describe this weekend's author event by Rick Riordan at Kepler's Books. The photo to the left is actually from last year's event at Hicklebee's. That event was a bit less hectic (though it seemed plenty busy at the time), and I was able to get a photo. This year, with this being the final book of the Percy Jackson series, and the Lightning Thief movie in progress, well, let's just say that I couldn't get another picture with Rick. I do have a few pictures of the event, though, if you'd like to click through to see. I also have have brand new information (in the Booklights post) about a completely different series that Rick is launching next spring... I'll have a review of The Last Olympian here soon - I read it in one sitting yesterday. I've been a fan of Laurie R. King's Mary Russell novels since the first book, The Beekeeper's Apprentice, was published in 1994 (well, technically I've been a fan since the paperback came out in 1995). In The Beekeeper's Apprentice, set in 1915, independent 15-year-old orphan Mary Russell becomes, after a chance encounter, apprentice to a nominally retired Sherlock Holmes (aka the beekeeper). In their first meeting, Mary is walking along on the moor reading a book, and literally stumbles across Holmes. He takes her for a boy. She takes him for a tramp. And so a life-altering partnership is born. Mary is young, bright and adventurous. She's the perfect foil for the sarcastic and sometimes supercilious Holmes. Since that first book, Russell and Holmes have had a variety of adventures on different continents, solving mysteries wherever they go. I've found all of the books to be clever, engrossing, and well-researched. The ninth book in the series, The Language of Bees, is due out on April 28th. "Readers often wonder how much of the author is in her story. How much of Mary Russell is actually Laurie King, anyway? I wrote The Beekeeper's Apprentice in 1987 during a time when I couldn't seem to find much of interest in the library, and I decided that telling myself a story would at least keep me for longer than reading one. And I wrote that book the way I have written all 17 books since then, by launching myself into it and seeing where it took me. Not knowing where the story I'm writing is going until it gets there means that when I finish, I then turn and look back at it, trying to figure out what I was aiming for. And when I've done that, I begin the rewrite with that aim in mind, seeking to make those key elements stronger and clearer. But sometimes, I've finished the rewrite and the book has gone off to be printed and I'm long past the point at which I can fiddle with the story, but I'm still not altogether certain what story the book is meant to be telling. Sometimes, it takes the first reviews before I begin to figure it out. One of the early reviews for The Beekeeper's Apprentice was in the San Jose newspaper. The woman who wrote the article, a combination of review and interview, noted that the book was for all those girls who had read the Sherlock Holmes stories and then realized, They don't mean me. Yes, I thought. Mary Russell may not be me—she's far more clever, infinitely braver and more resourceful, than the woman writing her on the page. However, Russell is me in the sense that she is who I would love to be, and without a doubt she is who I would love to have been at the age of fifteen. Independent (and independently wealthy) and sure and clever and physically competent to boot; quick-tongued instead of having laboriously to construct clever comebacks; possessing a trace of romantic tragedy in her past, instead of being boring and middle class. Heavens, she can even throw a knife with deadly accuracy! Mary Russell is a person able to argue with a man three times her age-and win. Who wouldn't want to be her?" So true! I would have loved to be Mary Russell when I was 15, too. And probably when I was 25. Thanks so much for sharing this, Laurie!! I can't wait to read the new book. And I recommend the series to all of you reading this, young adults and up, especially for those looking for strong female characters. Laurie R. King's ninth Mary Russell novel, The Language of Bees, will be published in April 2009, shortly after the first in the series, The Beekeeper's Apprentice, turns fifteen. Her website is celebrating with contests, activities, and Russell and Holmes events during this spring's Fifteen Weeks of Bees. 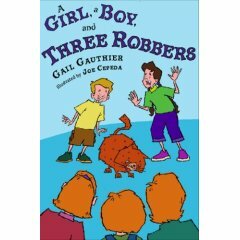 Welcome to the latest stop on Gail Gauthier's early reader blog tour, in honor of the release of her latest book: A Girl, A Boy, and Three Robbers (which I reviewed here). I don't usually do blog tours these days. However, Gail approached me about a specific tour to celebrate the launch of her second Hannah and Brandon Stories book, while also discussing and promoting early chapter books in general. She raised issues related to the quality of the books available for this age range and the lack of reviews that are published of books in this category. I agreed with Gail that this was a worthy thing to talk about. Instead of a traditional interview, I've chosen to participate in the form of a conversation with Gail about early readers. That is, I'm sharing my not-so-brief thoughts on this topic, and also asking Gail to share hers. Gail's responses are indented and in bold text. I personally think that early chapter books are among the most important of all books published. These are the first books that most kids read on their own. If they are dull, or talk down to their readers, then kids learn that reading on their own is boring. How will they ever move on to the wonderful variety available for middle grade readers if they think that books are dull or annoying? Gail, any thoughts on what the problems are with this genre, in terms of the kid appeal of what's out there? I think that because these readers are so young and so different from the adults who produce books, it's difficult for adults to know what works for them. While a lot of grown-ups are carrying baggage from their teen and pre-teen years, it's harder for us to remember what our day-to-day life concerns were when we were six or seven years old. You get a lot of silliness in early books, a lot of word play, a lot of funny-sounding names. Presumably the adults producing them think young kids like that sort of thing. The gimmicks often seem more important than creating a story. I just don't know how the average child reader feels about that. In addition, I know back when I had children this age, parents encouraged their kids to move on from these books as soon as they were reading fluently. I think treating chapter books as mere stepping stones to something better discourages their development as their own category or genre. I wonder if there are themes and situations important to kids under eight or nine years old that they could benefit from exploring in books directed specifically to their age group. If they hurry on to middle grade books, are they missing something? Gail, anything to add on why this category of books tends to get neglected in reviews? Do you try to read these books yourself? This would be a good question for some review journal editors, Jen. While I definitely agree with everything you're saying, I don't know if individual reviewers get to choose what they review. My guess is that editors make decisions about the mix of reviews for different age groups. Back in the 90s, I was advised to direct my writing to a middle grade audience because those were the kids who were really into reading. That was what was selling at that time. Then YA exploded and that's selling well now. Many of the kidlit review journals exist to help librarians, booksellers, and other professionals make decisions about what to purchase. Do editors decide how many reviews will be published in any particular category on the basis of how that category is selling because that's what their readership is going to need to know about? Do the number of nonpicture book reviews favor middle grade and YA for that reason? In addition, many books for younger kids are parts of series. I used to hear that some publications didn't review sequels, and so subsequent titles in a series wouldn't get a lot of attention. I don't know if that's the case anymore. I do see reviews for new Junie B. Jones and Clementine books, for instance. I do think writers should be aware of what's being published in their field, so, yes, I've been trying to read these books since I first became interested in writing a book for younger kids. Regardless of the causes, I think that we have to find a way to evaluate and publicize and write excellent books for this age range. Because otherwise our young readers won't learn to love books, and they'll never get to that magical middle grade reading stage of their lives. And that will be a huge loss. I had an experience recently in which I read an early elementary school title and though "eh", and didn't review it. My visiting 8-year-old niece, on the other hand, sat down to read that book the moment she arrived, read it again later in the visit, and asked to take it home with her. Obviously, she saw something in that book that I didn't see. This made me think about the other early readers that I've enjoyed recently. Sara Pennypacker's Clementine books are ones that I learned about from the teachers at A Year of Reading. Mary Lee and Franki have both talked about how much their students love Clementine. I also enjoyed The Five Lost Aunts of Harriet Bean, by Alexander McCall Smith. That book was recommended to me by an eight-year-old friend from Boston. He pointed out a humorous section from early in the book, and I trusted his judgment enough to get it for myself. Then there was Pa Lia's Big Day, the first of the Jackson Friends books. That recommendation came from Kelly Herold, or, I think, from her son. I'm also content to recommend, sight unseen, Mo Willems' Elephant and Piggie books, on the recommendation of Jules from Seven Impossible Things before Breakfast and her daughters. I like books with real stories that don't involve some kind of improving lesson. I understand that there's a long history of stories with some kind of moral in children's literature, but it's not something I can get behind. I recently read Jack Bolt and the Highwaymen's Hideout by Richard Hamilton. It's a time travel adventure with a well developed storyline, humor, and a number of illustrations. I like the Ivy + Bean books by Annie Barrows, which I think I first heard about through a blog. They're realistic stories about younger girls without a lot of adult characters helping the girls out. I also liked Violet Bing and the Grand House by Jennifer Paros, which I think I stumbled upon at the library. Violet is an anxious child, portrayed realistically. While browsing at the library I also came upon a couple of books in the Moose and Hildy series by Stephanie Greene, which would be appropriate for kids on the younger end of the range we're talking about. I didn't find the books as funny as I expected them to be, but they seemed very comforting and reminded me of the Frog and Toad books by Arnold Lobel. I particularly dislike books that rely on low gimmicks—funny words, humor related to bodily functions, etc. I have no objection to toilet humor and bodily function jokes when they are used to define character or are part of a real story. But when that's all there is, I feel the authors don't respect their audience and believe they don't have to do legitimate work to hold readers. It seems to me that a pattern is emerging here. More so than with books for middle grade and YA readers, the recommendations that have interested me in early readers have come, even if indirectly, from kids themselves. Sure, I've then vetted the books, made sure that the plot flows, and the dialog feels natural, and things like that. But they've first caught the eye of kids. But how can we depend on kids for the initial recommendations? We can't very well give every new reader a big stack of these books, and make them weed through to find the best ones. That would be turning the whole thing into homework. And yet... kids are much more qualified to make the first pass assessment of these books than we are. They know what they like. They know what books capture their attention, and make them want to read. You are talking about an issue that I've been thinking about for years, since soon after I started writing for children. To a great extent, children don't get to choose their own reading. That's done for them by adult authors, editors, reviewers, librarians, teachers, and parents. Realistically speaking, there's not a lot that can be done about that. The vast majority of children haven't learned enough about communicating and communicating in writing, in particular, to be able to write a book. They haven't acquired enough knowledge to edit a manuscript. It really does take a long time to learn how to do these things. So they can't provide a reading experience for their peers the way adult writers and editors can provide a reading experience for their peers, for other adults. There is no other group that doesn't have a hand in creating their own reading material. For instance, men don't have to read books that are written, edited, and reviewed only by women. Within every ethnic group there are writers who write of their cultural experiences. But that doesn't happen with kids. I can't think of any way to change that situation, but I am most definitely aware of it. I don't know that there is any way we can be sure that we're identifying books that will have the most appeal to kids. Personally, with books for younger kids I look for the same things I look for in books for any age reader—a logical, preferably unique, story and good characters. On top of that, I look for a story that is as child-oriented as possible with adult characters dominating the show as little as possible. Quite honestly, I can't be sure that that overlaps with what kids are looking for. What do you focus on when you write books for early readers, Gail? How do you keep the writing interesting for yourself, while also keeping the book accessible for the newest readers? With the two books I've written specifically for this age group (and the Aliens books, which were for the low end of the middle grade reading group), I tried to create situations in which the kids could be on their own without a lot of adult involvement even though they are under the care of an adult. In our culture, most children six to eight or nine years old are under adult supervision of some kind. It wouldn't be realistic to have children that age wandering all over town by themselves. So I have to find a way to get the grown-ups out of the scene while keeping them nearby. With the two most recent books, I've also tried very hard to make the cultural references appropriate to the generation of my readers. For instance, if I'm going to have the kids play with Legos, I go to the Lego website to see what kinds of sets are available now. Brandon watches Animal Planet because while I was having lunch in an elementary school cafeteria a few years ago, I learned that the kids at my table were into that cable channel. Now, let's talk about the Hannah and Brandon books. Will there be other books in the series? I know that early readers often enjoy series books. My original contract was for two books. It will be up to the publisher whether or not there are more books. Can we expect further character development in this series? Will Brandon develop his imagination more? Will he stand up to Hannah? Will Hannah ever stop being so bossy? Will the kids get older, and have a bit more leeway from Mrs. D? My kneejerk reaction is that we'll never see Brandon develop his imagination. He is Mr. Practicality, Mr. Real World. He may have opportunities to use that. I would like him to have opportunities to become the hero he wants to become. As far as traditional character development is concerned, that's a hard question. The Hannah and Brandon Stories are all about one particular situation—a girl with a hopped up imagination who uses the books she reads as the jumping off point for games she imposes on a reluctant companion. If the characters develop too much, then the situation changes and we have a totally different story. The Hannah and Brandon Stories are not parts of a serial. We're not talking one massive storyline that's so big it needs multiple volumes in order to be completed and you see all kinds of changes over the time span of the story being told. This is a traditional series. The books are each new adventures but following the same pattern. Though I do have one birthday story in mind, if the kids get too much older, we no longer have books about kids in the primary grades. I was thinking of Sherlock Holmes and Watson when I created Hannah and Brandon—a powerful, dramatic protagonist with a more run-of-the-mill sidekick who narrates. I don't remember a great deal of character development in the Holmes stories or changes in the relationship between Holmes and Watson. How do you get Brandon's voice so right? Are you channeling some sort of inner 8-year-old boy, or do you spend time listening to kids in this age range? I tried a draft from Hannah's point of view, and she just sounded like one more stereotypically smart girl. I tried a draft from a third-person point of view, and it sounded very instructive. Brandon's point of view was the one that worked. I have no explanation for why that happened other than to say that I am the mother of boys. My yard was full of boys for many years. Little boys are very close to my heart. I love the way many of Hannah's games seem to be inspired by books. Is this something you set out to do, or do you just think about what imaginary games kids would enjoy, and some of them happen to match up to books that you've read? If the former, are there games that the reader might not recognize, but that are also inspired by particular books (like the Vampire game at the start of A Girl, A Boy, and Three Robbers)? Yes, all the games are supposed to be inspired by books. All the stories are built around book "types" I recall from my lifetime of reading, and they are all types that exist in kidlit, though maybe not in early chapter books. At the Hannah and Brandon site, you can find a page called What's Hannah Been Reading? that lists age appropriate books related to the stories in the Hannah and Brandon books. It's a work in progress, and I haven't gotten to the Three Robbers book yet. There are many vampire books for kids. I just haven't yet found one I think Hannah could have read that strikes me as just right for the page. The pirate chapters in the first book came about because I had just seen one of the Pirates of the Caribbean movies. I knew there were pirate books for kids, so I ran with it. Last week I saw Seven Samurai. I wondered about a samurai story for Hannah and Brandon, but I'm not aware of much in the way of samurai books for young kids, so I'm not too interested in pursuing that line of thought. I also like the way that Mrs. D is as a parent, flexible about the imaginary games, but strict when it comes to staying in the yard, wearing boots in the rain, etc. But then I love the scene where Brandon and Hannah manipulate her, by suggesting that another parent has insulted the family cat. Is this something that you deliberately provide for kids of this age range, the combination of a firm parent with the occasional kid triumph? I don't think of it so much as kids triumphing as I do giving them the best lines and the opportunity to solve the problems. I never want adults to be the problem solvers or clear heroes in my books. Children will always be the center of everything in the children's books I write. However, I want the adults to be realistic, too. Those ineffectual, bumbling parents you see in a lot of kids' books really set my teeth on edge. I also do nurturing parents because I feel monster moms and dysfunctional dads are pretty well covered by other writers. There's nothing wrong with them appearing in kids' books. The world just doesn't need me to be creating any more of them. Do you have any plans for other books for this age range, not part of this series? I have been thinking for many years about a 365 Bedtime Story book that I was very fond of when I was a child. I'd like to do something contemporary along that line, but it would involve 365 one-page stories. I'm finding that pretty overwhelming. Nonetheless, I've been thinking this year about the families and characters that might be involved and some story arcs. Do you have any advice for other writers working on books for this age range? Search for good stories and original characters, just as you would if you were writing for any other age group. Try to avoid doing what everyone else is doing. There seems to be a lot of duplication out there, lots of far-fetched superhero stories, lots of cute girl stories. Avoid gimmicks. Treat your readers with respect. And that's all for today. Thanks so much for stopping by, Gail. Be sure to stop by Original Content, too. Gail has not been leaving the work of posting to the interviewers. She has been featuring other early reader titles and commenting on the interviews. Don't miss the SBBT! The interviews have been amazing so far. All I really have to say is: Vivian (HipWriterMama) was right. Seeing Rick Riordan speak is an inspiration. I was fortunate to be able to attend Rick's event yesterday at Hicklebee's Children's Books in San Jose. And OK, I do have a bit more to say. It was 100 degrees out, and didn't seem that much cooler inside the store, which was completely packed (see photo below). But it was completely and totally worth it to see so many kids so excited to hear from an author. God bless the people at Hicklebee's. The event extremely well-organized, despite the heat and the crowds. They gave out numbers as you arrived, so that people didn't have to stand in line. Being compulsively early by nature, and not having to wait for any kids to get out of school, I was fifth. (To the young woman who was first, if you're reading this, I hope it was worth the trip, and I look forward to seeing your books on the bestseller list one day in the future). So I got to meet Rick, and get a photo taken, and have a couple of copies of the new book signed. He knew who I was right away, which was very cool. Of course my Hunters of Artemis shirt was a bit of a clue. But still, it was great to finally meet Rick in person, after interviewing him last year and all, although the crowd was too big for much of a chat. He spoke for a half hour or so. And because the Hicklebee's team cares passionately about kids, the kids were all on the floor in front, where they could see, with the adults standing in the back and around the sides of the store. Rick read from the new book (and man, can he ever channel Percy - you can tell he's spent lots of time with middle school boys in his life). He also spoke a bit about the background of the book, and then he mostly just took questions. I can't even express how great it was to see all of those kids, eager and excited and asking great questions (like, could a God and a demi-god ever have a child together? Answer: well, that would be interesting, wouldn't it, but the demi-gods don't usually live that long). As Vivian noted, there was much rejoicing about the prospect of the movie version of The Lightning Thief (scheduled for release in fall of 2009, and being directed by Chris Columbus). The kids were also very excited to learn that there will be another series after the Percy Jackson books wrap up, featuring the same world, but different, younger characters. Rick also talked a bit about his upcoming 39 Clues books, and the kids were pretty keen on that, too. Honestly, you had the feeling that if his schedule permitted (and if it hadn't been so crazily hot), Rick would have stood there in front of the room until every kid had every question answered. He clearly loves seeing kids excited about books. And he doesn't talk down to them, or let the attention go to his head in any way. For me, it was a validating experience, to see how much of an impact one person with a passion can have on kids and reading. Of course he had a lot of help, especially from his family and his publisher. But still, one person sat down and wrote these books - and kids all across the country and around the world are enthralled, engaged, and READING. That, my friends, is how you make a difference in the world. I'm so glad that I went to the event! Making the afternoon even better - I was able to hang out with Becky Levine and her son. Becky and I had a great chat, and it was wonderful to finally meet her in person, after exchanging blog comments for ages. Her son wasn't much of a conversationalist, because, you know, he had the book in his hands, but it was fun to see him completely tune out the crowd, in favor of the real reason we were all there - the wonderful Percy Jackson books. Becky's thoughts on the event are here. Mheir came, too. He was a bit late, and wasn't able to meet Rick (because he - Mheir - had to go back to work), but he was able to hear the talk, and see the buzz. 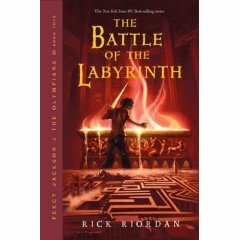 And now we have two copies of The Battle of the Labyrinth to read. So, if you don't hear from me for a bit, you'll know that I'm reading. I'm popping in for a quick post or two during the 24-hour interval that I have between a six-day trip to Texas and Louisiana (for a wedding, and some visiting) and having guests come to stay. And I wanted to tell you a story that I think is a classic example of how cool it can be to be a children's book blogger. Mheir and I were in Austin, Texas on Monday. We'd just gone to lunch at my favorite margarita place from grad school, Trudy's (and yes, the margaritas are still good). Then we went with our friends to pick up their daughter from middle school. We were standing outside the school when my always helpful friend, spying an approaching parent, said "Oh, you should meet Brian." 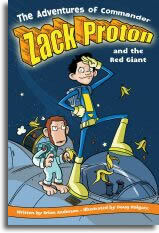 Turns out that Brian is Brian Anderson, author of the Zack Proton books. Turns out further that Brian reads my blog (and also mentioned Book Moot and Three Silly Chicks). He recently helped suggest books for Matthew, and he mourned a bit for my lost books. He mentioned how envious his other daughter would be of my Hunters of Artemis shirt, and we talked about the coolness of Rick Riordan for a bit. After some chat, I said that I'd like to read his books, which are aimed at reluctant readers / early elementary school kids (which, as you know, is a particular interest of mine). Brian promptly returned to his car, got copies for me, signed them, and posed for a picture (I'm standing on a big rock - he's much taller than me). All while we waited for the kids to come out of the school. If this is the life of a kidlit blogger, it is pretty cool. P.S. I read two excellent books on the trip: World War Z by Max Brooks (which I remember Liz from Tea Cozy recommending quite a while back) and The Compound by S. A. Bodeen. Both gripping books that I couldn't stop thinking about. More detail soon. I have a young friend who is nearly one. His parents read Scaredy Squirrel Makes a Friend to him every night (a gift from his Auntie Jen), and he has a particular page on which he likes to give Scaredy a little kiss. He doesn't seem old enough to have Scaredy's fears of the unknown, so there's something else that's resonating with him. I think it's Scaredy's endearing expression, that timid, toothy smile. And I know that the humour is what works for me as an adult, and that some of the humour is kid-friendly, and some of it is more appealing to adults. Mélanie: That's SO sweet but I absolutely need to know what page…I'm curious!. My young friend's Dad reports: "the page that (our son) never fails to kiss everytime we turn to it is the layout on pages 5-6 from "Scaredy Squirrel Makes a Friend." And his mom (a dentist) also appreciates the dental references and dedication of the book to a dentist." Yes, Scaredy is a big hit in that household. Continuing with the interview, what aspects of the books do you think particularly appeal to very young children? To preschoolers? Mélanie: The colourful cartoons and the simplicity and the cute little squirrel has something hopefully to so with it! Mélanie: I think they like the pacing of the book and how the story is told through graphics and cartoons. I have been told by kids that they enjoy when Scaredy is capable of doing braver things. They like the humour and I heard that the Playing dead page is really popular! I think they can relate to Scaredy because he's discovering the BIG world and doing his best to deal with the unknown and Scaredy's not perfect. Mélanie: I hear it's the humour and the interaction they get while they read with the kids. Also I think the book has many levels and it pokes fun at our society and exaggerates our sometimes excessively overprotective behaviours. I would also like to mention that surprisingly teens are picking up the Scaredy books as well. There seems to be a ¨cool¨ factor about Scaredy. And grandparents are writing to me as well! Scaredy seems to have captured the hearts of many age groups! Is there a perfect age range for a reader of the Scaredy Squirrel books? If I'm going to buy the books as a gift, what's the very best age for Scaredy appreciation? Mélanie: I'm not sure what to say, but I think it's between 3 and 8, but as I was saying I am getting feedback from people from all ages! Does it just vary by the individual? Mélanie: It does. And I think that's great! I've noticed that some of the vocabulary used in the books is actually fairly advanced (like when Scaredy contemplates "venturing" into the unknown. Have you seen any difference in the response to Scaredy from boys vs. from girls? Or are Scaredy's fears universal? Mélanie: I think they are universal. And the response has been great from both girls and boys. They write to me with story ideas for the next Scaredy adventures and it's fun to see how imaginative they are and how they want Scaredy to face up to new fears. Did you consciously set out to write books that would be appealing to parents, as well as to their children, or is that a happy side-effect? Mélanie: Well, when I start writing a book, I try to make it appeal to me first (I'm 32). I want to feel like the story is saying something about a topic I feel is interesting and that I can relate to. I also keep in mind that kids enjoy images that they can discover as they read over and over. I like to keep my texts simple and light and provide drawings that can fill in the blanks or that kids can interpret in their own way. I adore the bold lines, and the personality conveyed in even the tiny icons (like the killer bees and the germs) of these books. How do you think that your background as a graphic artist has helped you to create books that appeal to such a wide range of readers? Mélanie: My design background plays a HUGE part in my work. And in my opinion, being both an author and illustrator is pretty much the only way I can make my ideas come to life. When I start working on a new book, I start with visuals and sketches and build the story in my mind, then I actually write then rework my drawings and pages to allow good pacing. I go back and forth with the text and images to get the perfect merge. I thought that Scaredy Squirrel Makes a Friend was especially suited to kids about to start school for the first time (whether preschool or kindergarten). Have you heard from parents who have used the book in this way? Is it finding a place in classrooms? Mélanie: I have and the message I hear from kids with the Makes a Friend book is that it's about understanding that not everyone is perfect and not to judge a book by its cover and that friendships can be made in unexpected ways. I hear Scaredy is a big hit in classrooms especially for writing activities. I think that the fact that the Scaredy stories are broken down into graphics and pros and cons and maps help kids kick start their imagination when it comes to writing their own story. If you think about it, you do need and plan when it comes to writing stories and Scaredy is a good example to inspired kids because it's a simple and direct storytelling style. I really love Scaredy. I want to pick him up and hug him. Are there any plans for merchandising, like a Scaredy stuffed animal? I would certainly buy one (well, probably two, one for me, and one for my one-year-old friend). Mélanie: I would LOVE that too! I always imagined a stuffed Scaredy toy Playing Dead and you could just leave him lying around in a room somewhere! There is talk about merchandising and stuff… I'm keeping my fingers crossed! He's left his tree. He's made a friend. He's been to the beach. What can we expect next from Scaredy Squirrel? Will he ever find romance? Mélanie: Who knows but as a kid I would probably think…GROSS!! In the next adventure I will focus on the nighttime fears. That's all I can say and I can't wait to get started!! Thanks, Mélanie, for this reminder of how much I love Scaredy. This blog tour was organized by Raab Associates. I hope that you'll stop by all of the stops on the tour. Scaredy and I would love to see you. Text © 2009 by Jennifer Robinson of Jen Robinson's Book Page. All rights reserved. Don't miss today's Scaredy Squirrel interview over at Big A little a. It's a rare thing for our nervous young friend to put himself out there for an interview, but he seemed quite comfortable with Kelly's questions. My favorite was about whether or not children make Scaredy nervous (you'll have to read the interview to find out). Scaredy Squirrel's author, Mélanie Watt, will be here for an interview on Wednesday. Scaredy Squirrel Blog Tour: This Week!